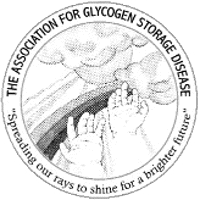 "Spreading our rays to shine for a brighter future"
The Association for Glycogen Storage Disease - AGSD - was established in 1979 in order to create an organization which would be a focus for parents of and individuals with glycogen storage disease (GSD) to communicate, share their successes and concerns, share useful findings, provide support, create an awareness of this condition for the public, and to stimulate research in the various forms of glycogen storage diseases. This website provides basic information about the glycogen storage diseases. The information is intended to be of use to people affected by one of the glycogen storage diseases, their families, and other interested parties. Some forms of GSD cause little in the way of illness, while others are life threatening. Included in this site is a description of the general symptoms, associated problems, current treatment, and long-term outcome for the most commonly diagnosed glycogen storage diseases. It does not do justice to the difficulty patients and their families' experience, and their deep desire for improved forms of treatment or ultimately total correction. Diagnosis of a rare genetic disease can be a very lonely experience for the patients and their families, and in some cases, for their doctors also. These pages are intended to help reduce that sense of isolation by providing not just information, but also a point of contact.